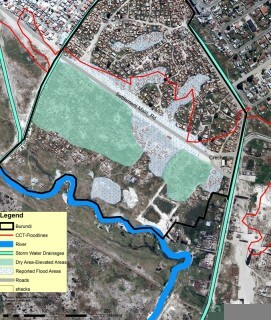 This is a map of the floodlines in Mfuleni, Cape Town. The Green, Blue, Yellow and Red lines indicate the possibilities of this area being flooded in 10, 20, 30 and/or a 100 years respectively. 1/3 of Burundi settlement lies below all four these areas, indicating a high risk area for flooding and disaster. Some of these areas have been evacuated, and affected families were relocated to the close by Temporary Relocation Area (TRA) called Busasa. 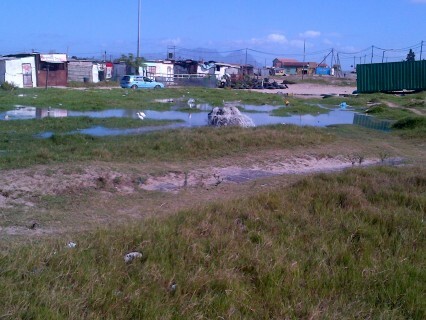 Like many other informal settlement in Cape Town’s low lying areas, called the Cape Flats, Burundi has many service delivery problems. 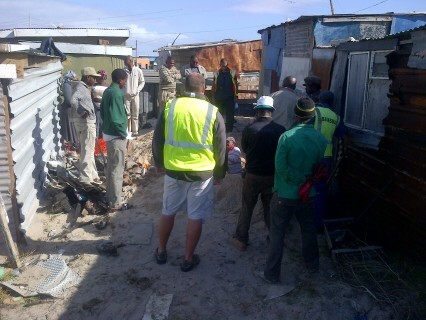 The settlement is situated in flood zone and thus far the City has refused to regularise and upgrade the area. Hence, there are no legal electricity poles. Only those closer to the formal houses have electricity through illegal connections and paying premiums for the service. In 2011, when the community of Burundi first made contact with the Informal Settlement Network (ISN), an enumeration was conducted, which was followed by a mapping exercise. The community wanted to find solutions to their settlement-wide issues, such as flooding, low service levels, insecure tenure and lack of infrastructure development and ground work. The community struck the ISN as being self-organised with a willingness to engage with government. The enumeration and mapping exercise really strengthened the community’s plight, and it was presented that more than 3/4 of the settlement was located in what the City of Cape Town deemed as “land unsuitable for development”. When the MoU with the City of Cape Town was signed in 2012, Burundi was one of the 22 projects in partnership with the City, where an in-principle commitment was made to roll out electricity services. This could then also have been seen as a step towards tenure regularisation, and an application for Upgrading of Informal Settlements Programme (UISP) was a viable option. Despite these potential forward looking alignments, there were considerable hesitation on the part of the City to move on the community’s plans, citing ten reason why this wouldn’t work for every new recommendation. Yes, the area is flooded, but a careful analysis of the site reveals large areas that can be upgraded. 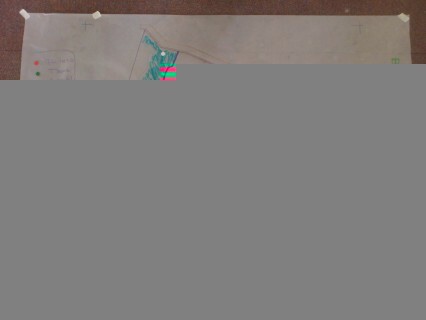 This was incorporated into the community’s plans they presented to the city. The sketches above shows the elaborate work done by the community to point to all the major points of interest in the settlement. 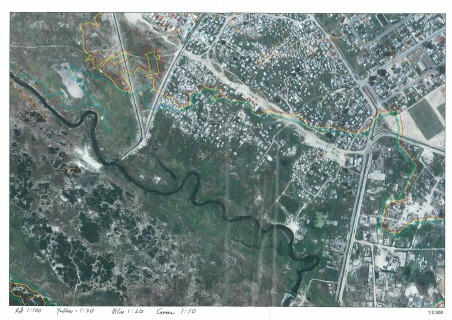 The second drawing shows that only certain parts of the area under the red “floodline” is prone to flood. With this level of spatial information, the community continued to engage the City in a number of “partnership meetings” with the City. After this broke down, the community decided to protest, and in the process one of the housing offices in Mfuleni was vandalised. This unfortunate event however did draw the attention of the senior decision makers in the City, who organised a community meeting three days after the protest. At this meeting, the City agreed to test the viability of installing electricity in areas under the floodline identified by the community. 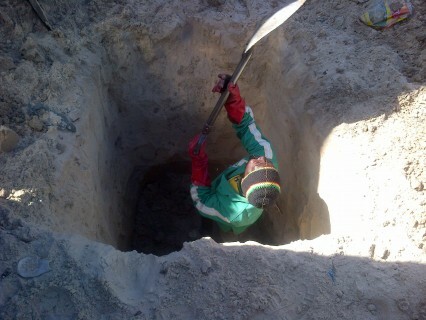 Last week the community started digging test holes to review the viability of erecting electricity poles and infrastructure. This was done under supervision of City engineers and field officers The roll out of the electrification of Burundi will be scheduled for a future date. We will continue to update the blog to track the story. We people from Mfuleni, weather you black,white,coloured,green,blue or whatever colour you are LETS FIGHT THIS.